There are thousands of popular little girl hairstyles that you may want to learn and become familiar with for your next special event or just for something new for everyday. Little girls love to have their hair done just as much as you do, and learning more about the new trends you can make your little girl feel like a princess in just a few short minutes! Check out these different hairstyles and techniques below and see if they fit your little girl’s hair length and preferences. Every mother likes the convenience of short hairstyles for their little girls because they are easy to maintain. Just as with adults today, the bob is a very popular and can be varied in many different ways to mix it up for different occasions and events. You can straighten the hair, curl it or even create the casual waves that are so popular today. All of these options are quick and easy to create so your little girl will not become impatient during the process! Another great feature of this great hairstyle is it will last all day with very little product. For little girls with medium hair lengths you have more options such as half up look with barrettes or clips, pony tail and even bangs. Many mothers do not like to have bangs on their little girls because they can be so hard to maintain but the side swept bangs are pretty much self contained, so there is nothing for you to do but brush them. These bangs go with everything and you can create the long curls that create a look for special occasions or for everyday. Little girls love to have accessories in their hair such as barrettes, hand bands, pony tails, clips and ribbons. You can be sure that no matter what hairstyle your little girl has, that there is a perfect accessory out there to further compliment it and make their hairstyle a bit more unique. Accessories are a great way to spice up your little girl’s hairstyle without having to do a lot of styling or even change their cut. It is important to remember not to use a great deal of products or styling tools when your little girl is under the age of 5years old as they can greatly damage their hair and it can be hard to recover from at such a young age. Take advantage of their young age because they can literally wear any type of hairstyle and look cute! Of course you want to find styles that do not require a lot of maintenance on your part, but there are tons to choose from. 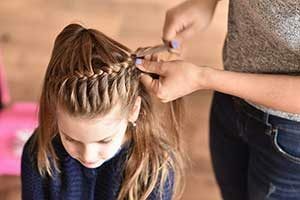 Little girls love to be pampered and a great idea is to take them with you to the salon and see what your hairstylist thinks would be a great look for them. This is not only a great way to find a new hairstyle for the year but to create a nice bonding day as well with mother and daughter.You can always count on little girl hairstyles to remain the same and classic as they always have. Although little girls are becoming more and more concerned with fashion and style, they will still enjoy their little girl cuts before they want to start looking like their favourite celebrities. Allow your little girl to be creative and change their style whenever they want with accessories and a little product. Enjoy this young age and their love for being pampered with their mother, with so many little girl hairstyles to choose from your little girl will look great no matter where she is.